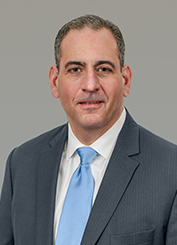 Since he joined the firm in 1999, Mr. Iafrate has played an integral role in the growth and success of the Office Properties Division at L. Mason Capitani CORFAC International. He is a member of the firm’s executive leadership team that is tasked with making many of the firm’s most important strategic decisions. Mr. Iafrate is regarded to be one of the most experienced and knowledgeable individuals in the industry due to his diverse track record of selling, leasing and developing office and medical properties. He is also well versed in the disposition and acquisition of commercial investment properties. Mr. Iafrate maintains a large portfolio of exclusively listed properties in Metropolitan Detroit on behalf of his long-standing clients. Mr. Iafrate holds a Michigan Associate Broker License and he is a member of the Commercial Board of Realtors (CBOR). He is also a member of the Society of Industrial and Office Realtors (SIOR).